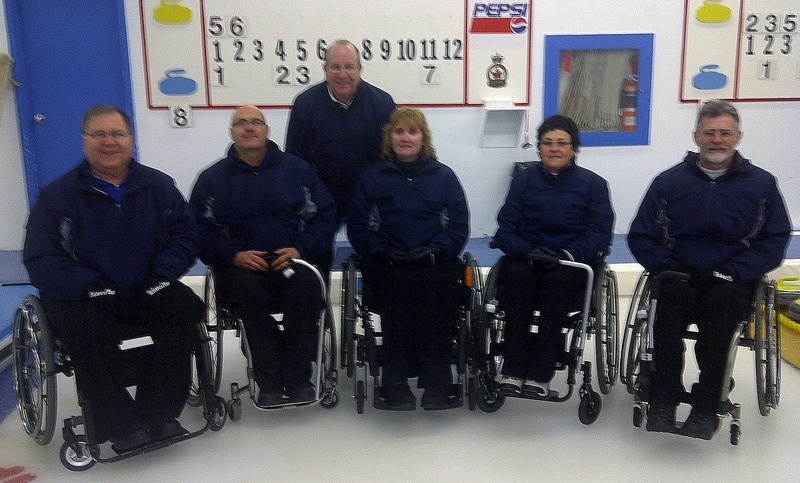 Six teams will be competing at the Toronto Cricket and Curling Club this week for the Dominion Provincial Wheelchair Curling Championship and the right to represent the southern part of the province at the Nationals in Edmonton, March 21-27. Defending champion Bruce Cameron of Ottawa returns with Doug Morris, Jamie Eddy and Christine Lavallee. Fellow RA Curling Club skip Richard Fraser has two females on his team; Joanna Bos at 3rd and Clare Argo at lead, while Don Stinson plays 2nd. Ilderton CC is bringing two teams to the championship this year. Mark Ideson skips Mike Munro, Tony Reynen and Jacqui Kinahan. The second team is skipped by Dal Wrigley, who moved from Chris Rees's team, Gilbert Blanchette, and two players born in Africa; Hocine Zenile, originally from Algeria and Peninah Mutindah, originally from Kenya. Ilderton coach Ernie Comeford says all but Jacqui Kinahan are fairly new to the sport. First Draw is 10AM tomorrow (Tuesday February 1) with five round robin draws being played through Thursday morning. The top team will go straight through to Friday's final to be joined by the winner of the 2 vs 3 semi-final game. Daily line scores from the Championship should be available from the Ontario Curling Association's website. 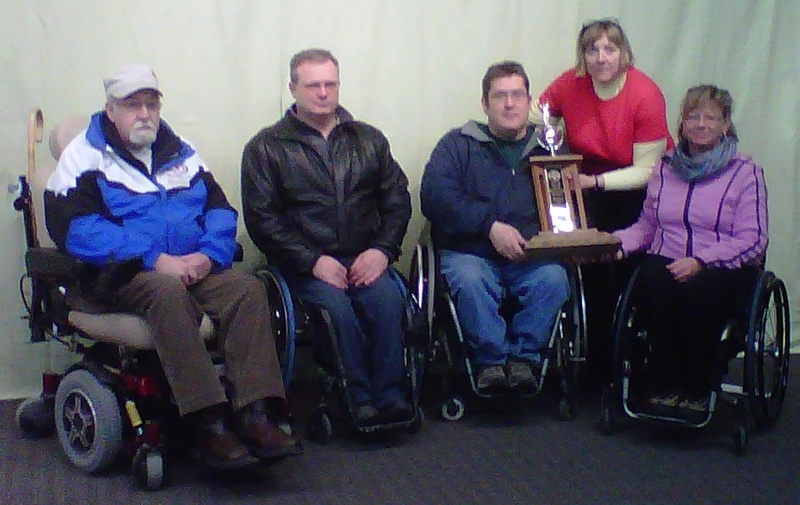 Calgary's Team Yizek, playing on home ice and looking for their fifth consecutive provincial title, went out to an early 7-0 lead over Edmonton's Cliff Nuspl in today's final of the Alberta Wheelchair Curling Championship at the Ogden Legion CC. After the break, Nuspl took a single in 5 and stole 1 in the 6th, but gave up 4 in the 7th. Yizek won 11-2. Team Yizek, with Jack Smart, Anne Hibberd, Bridget Wilson and Martin Purvis, is a talented team that has been working together since Ernie Comerford started the program in Calgary in 2004. Bruno Yizek is a Paralympic gold medallist who will be in Prague defending Canada's World title in Prague in three weeks. Both Anne and Bridget have also worked with the Team Canada squad, and their experiences have been integrated into the teams practices. Now coached by Andy Jones, for the past two plus seasons they were guided by Tony Zummack, newly appointed British national coach. He told me the team prepares just as hard as Team Canada; the only diference is lack of access to the specialists and off-site resources that the national team enjoys. Team Yizek's experience and the time and effort they put into preparing for championships, made them heavy favourites to repeat as provincial champions. In seven weeks they will know if they are good enough to go one better than in 2007 and 2009, and break BC's stranglehold on the national championship. Five time defending champion Bruno Yizek's rink reached the finals of the Alberta Provincial Wheelchair Curling Championships at Calgary's Ogden Legion CC, defeating fellow Calgarian Dale Keith 14-6 with seven unanswered points in the second half of the game. Cliff Nuspl beat David Graves 10-2 in the battle to choose which Edmonton team would reach the final and therefore gain a place either as champion or host at the Nationals March 20-27. Norway have been practicing this weekend at the Halden Curling Centre in southern Norway close to the Swedish border. "The ice is keen, with good curl, I like it!" Thoralf Hognestad, their coach, told me. "We're lookijng forward to playing in Prague, and are going for the Page playoffs." The team leaves for Prague on February 19. "I have a good feeling," says the coach. Ken Gregory, right, and local curler David Kemp, at CPAO Funspiel. Ken Gregory and his Bradford team curled in the 2nd annual Canadian Paraplegic Association Ontario Funspiel last Saturday as a practice session for their upcoming competition at the Provincials, being held in Toronto, February 1-4. "We only get together at the Bonspiels," Gregory told Miriam King of the Bradford Times. "This is our big warm-up." Ken Gregory's Team Bradford has Collinda Joseph 3rd, Frank Cannarella 2nd and Jim Primavera at lead. Team Canada made an unannounced appearance at the Kelowna CC this morning and are on the ice now (noon) in what is the last opportunity for the team to get together before the Prague Worlds (Feb 21 - March 3). The BC Provincials are next weekend, and Jim Armstrong is due to be in Seattle the following Friday. National Team Coach Joe Rea is leading this weekend's session. They have ice time booked for 8AM tomorrow (Sunday) for anyone local interested in seeing them. Sunday Update - Chris Sobkowicz has joined Jim, Darryl and Ina for the Sunday morning session. In the last draw in the four team round robin for the Alberta Provincial Wheelchair Curling Championship, the Calgary teams played each other - Yizek beating Keith 10-1 in 6 ends. They'll face each other again in the 1v4 semi-final. Nuspl beat Graves 7-3 and will face each other in the all Edmonton 2v3 semi-final. Keith losing to Yizek this morning means the final will have a team from each community. With two teams to qualify for the Nationals, this guarantees there'll be an Edmonton team at the Nationals in Edmonton in March. Do you play in a club league, and if you do, does your team have a uniform? Press the button on the right margin of the blog, that corresponds to your answer. I was surprised by the results of last week's poll. Asked where you would want your lead's and the games's first stone to end up, two thirds of the 30 respondents called for a front stone, with half caling for a front corner. This was what the coaches I encountered in BC were advising 7 or 8 years ago, and I'd thought tactics had moved on since then. Yes a front stone is not immediately removable, and if I was relying on a steal to win a game, the standard play would be a front stone on the centre line. As the opening stone of the game? I don't think so. I think the more experienced teams ask their leads to come into the house, and if you are going to do that, then why not throw to the wings, where it might be more difficult to hit? Putting the first lead stone in the house challenges the opposition; hit it and maybe we can all throw a few stones to get the feel for the ice on our way to a blank end. 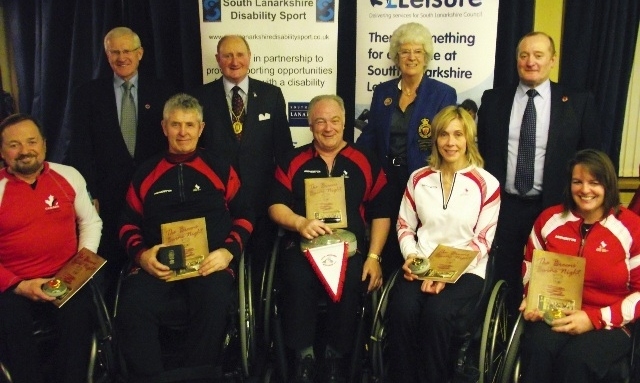 And of course, because wheelchair curling is a game of misses, maybe you're sitting one as you throw your second stone. Or maybe the opponent decides to come into the house in which case you can hit and perhaps lie two. Or they throw a front stone and then you have an opportunity to start the game lying two. So I want my first lead stone in the wings, daring the opposition to hit it. If they do, I repeat. If they don't. maybe I begin the game sitting two. Seems a winning strategy to me, even though it appears a minority view. Comments? 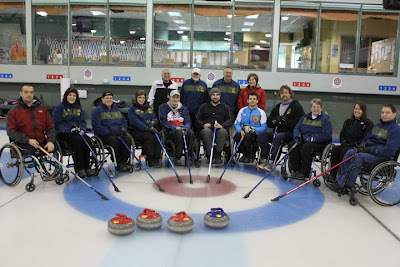 Calgary and Edmonton each have two teams competing at the 2011 Alberta Provincial Wheelchair Curling Championships being held at Calgary's Ogden Legion Curling Club. In the opening draw, heavily favoured Team Yizek played against their 2010 alternate Cliff's Nuspl's Edmonton rink. The teams were tied at 2 at the 4th end break, Nuspl pulled ahead 4-2 after 6, but could not hold on as Team Yizek put three more on the board to win 5-4. Edmonton posted a win with Dave Graves defeating Calgary's Dale Keith 7-3. In the second draw Yizek (2-0) beat Graves (1-1) 12-5 and Nuspl (1-1) beat Keith (0-2) 7-3, both games called after 7 ends. Jim Armstrong and his son Gregory were to appear in Judge Martinez US Federal Courtroom tomorrow, January 28, for sentencing related to their plea agreements signed last October. The case has been continued and sentencing rescheduled because the US District Attorney's Office did not complete in time the paperwork that the Armstrongs require to be allowed into the United States. Sentencing is now set for Friday Fenruary 11 at 1.30PM for Jim, and 2PM for Gregory. 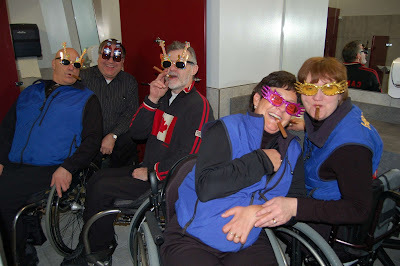 A very experienced wheelchair curling coach suggested to me recently that the up-and-coming team in Canada was Team Lessard from Quebec. They're young, proven athletes in other disciplines, who with coaching will be the team to beat in the years to come. They also won the Cathy Kerr Spiel last November. They were among the ten Quebec wheelchair users attending the CCA's Talent Identification and Development Camp last weekend at the Boucherville Curling Club, receiving guidance from national team coach Wendy Morgan and Team Canada 2nd, Ina Forrest. Quebec's Provincial Championship is scheduled for February 25-27 at the Victoria CC in Quebec City. Un entraîneur très expérimenté de curling en fauteuil roulant m’a commenté récemment à l’effet que l’Équipe Lessard du Québec, est sans doute la plus prometteuse sur le circuit canadien. Il s’agit d’une formation jeune, mais en plus, tous les joueurs pratiquent une autre discipline sportive qui fait d’eux des athlètes accomplis à tous les niveaux. Avec un bon entraînement, il est à prévoir que l’Équipe Lessard sera la formation à vaincre dans les années à venir. Cette formation a d’ailleurs remporté le Cathy Kerr’s Bonspiel en november dernier. C’est par l’entremise de Curling Canada, qu’une dizaine de joueurs en fauteuil roulant du Québec ont participé pour la première fois, à un camp de développement et d’identification de joueurs potentiels cette fin de semaine au Club de Curling de Boucherville. Tous ont pu profiter des judicieux conseils de l’entraîneuse nationale Wendy Morgan et de la seconde joueuse d’Équipe Canada Ina Forrest. Le championnat provincial du Québec est prévu pour les 25 au 27 février prochain au Club de Curling Victoria, Ville de Québec. The Alberta Provincial Championship will be held at the Ogden Legion CC in Calgary from Friday January 28 with the final on Sunday January 30. As last year, four teams will compete; two from Calgary and two from Edmonton. Team Canada alternate Bruno Yizek rejoins his Calgary teammates after Paralympic duty last year. Team Smart 2010 thus becomes Team Yizek 2011 with Bruno Yizek at skip, Jack Smart, Anne Hibberd, Bridget Wilson and Martin Purvis, the all-star 2nd at last year's Nationals in Kelowna. 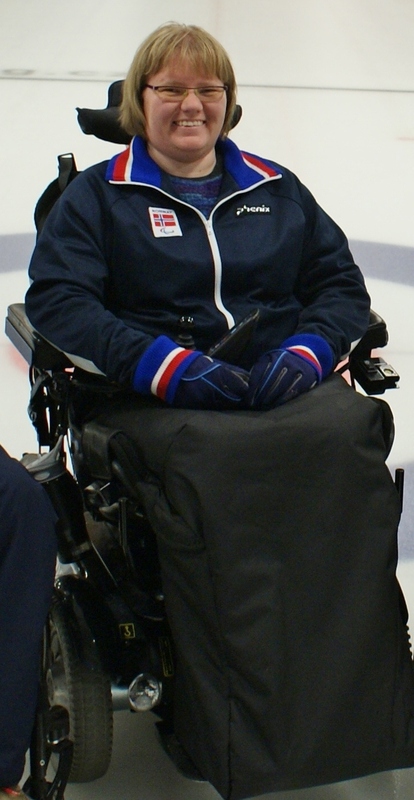 Their coach for the past two-plus seasons has been Tony Zummack, now newly appointed Great Britain wheelchair curling coach. He tells me: "The coaching duties for Team Yizek are now in the capable hands of Andy Jones. "I look forward to their continued successes knowing their goals and ambitions. If I am still in Calgary during the Provincials I will be keeping an eye on them as a fan and a friend. "The decision was made to have a new coach with the team prior to the Provincials so that the transition moving forward would be as smooth as possible and give Andy time to know the players. I have spent the last month with the team and Andy providing as much insight to their development and team philosophies as possible. I am confident that all 5 players and Andy are prepared and looking forward to the upcoming competitions." Brian Rivers coaches Team Keith, Calgary's other contenders. They have Dale Keith at Skip, Karl Meier 3rd, George Assenheimer 2nd, Wanda Pizzinato at lead with Curtis Junor the alternate. Edmonton's Cathy Craig is bringing two teams to Calgary. Cliff Nuspl, who skipped an Edmonton team in 2008 and 2010 and was invited to join Team Smart as allternate in Kelowna last year, has Mike McMullan 3rd, Warren Fleury 2nd, and Shawna Walsh at lead. The second Edmonton team is skipped by Dave Graves throwing 3rd stones, with Don Donaldson throwing 4th, Dwaine Shupac 2nd and lead Marie Laframboise. Doug MacEachern is the Edmonton alternate. The format is a 3 draw round robin (first draw 11AM Friday) with 1 v. 4 and 2 v. 3 semi-finals 2.30PM Saturday, then a Sunday 10.30AM final. Because there will only be 9 provincial teams competing at the Nationals in Edmonton, Alberta will field a Host team. That means that both teams competing in the Alberta final will play at the Nationals. New Brunswick's first wheelchair curling event, a spiel this weekend at the Frederickton CC, has been cancelled because of insufficient entries. Laughie Rutt, 3rd on Nova Scotia's provincial champion Team Fitzgerald and a long time evangelist for curling in Atlantic Canada, said that though the cancellation was a disappointment, several curlers from New Brunswick and PEI were able to attend the recent Atlantic Development Camp at Crapaud CC. "There are some promising players in both PEI and NB," he said, "and they will soon be on the scene at nationals." The CCA had hoped to add a tenth Provincial team to the schedule for this year's Nationals in Edmonton (March 20 - 27) but with New Brunswick and PEI deciding they were not yet ready to compete, Alberta will field a Host Team to round out the numbers, as has been done several times in the past. Last year BC's Host Team, skipped by Gary Cormack, won the National Championship in Kelowna. 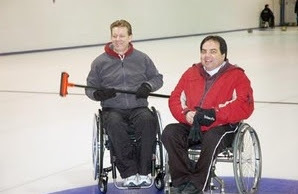 I'd like to publicly thank the Calgary Wheelchair Curling Association for their very generous donation in support of this blog and wheelchaircurling.com. Their show of support, along with the others I receive from time to time, allows me not only to recoup the expenses of runing the blog and website, but also makes it easier to justify the time that I devote to keeping up with what's happening in wheelchair curling, both in Canada and around the world. Team Cameron and Team Fraser of the Capital WCC competed in this weekend's 50th Ottawa Valley Mixed Spiel at the RA Cemtre in Ottawa. They were part of an eight team Recreation Division, both reaching the final rounds. Bruce Cameron, with Doug Morris, Jamie Eddy and Katie Paialunga (filling in for Christine Lavallee, who was sailing in a Miami regatta) won the trophy, beating a team of able-bodied curlers 3-2 in the final. 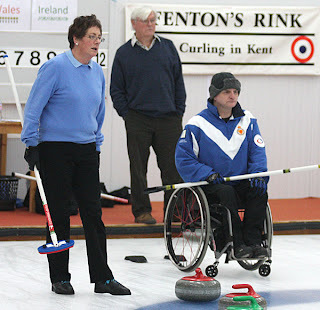 Fenton's Rink, located near Tunbridge Wells in Kent, south-east of London, is the only curling ice rink in England. This weekend it is the site of the Four Nations Competition, hosted by the English Curling Association, between teams from Scotland, England, Wales and Ireland. Skipping and throwing 3rd stones for Scotland in the Tom Ballantyne Trophy competition (highest aggregate score over five games against England in the year) was Michael McCreadie, playing with Stephen McClymont, Graeme Maguire and Gerry Crighton. Michael also skipped Scotland's Mixed Team against Wales. Just 31% of those taking last week's poll felt that Canada would win all their games in Lanarkshire, but they were correct. It's the first stone of the first end and your lead throws the exact shot you called for. Where did the stone end up? Press the button on the right margin of the blog, that corresponds to your opinion. 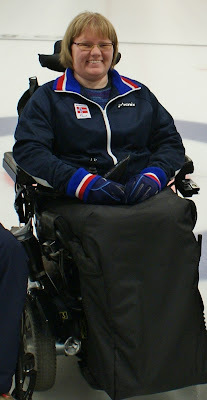 Tone Edvardsen, will be the first to take advantage of the change in the World Curling Federation's rules of competition, when she plays second for Team Norway at the 2011 World Championships in Prague using her power chair. 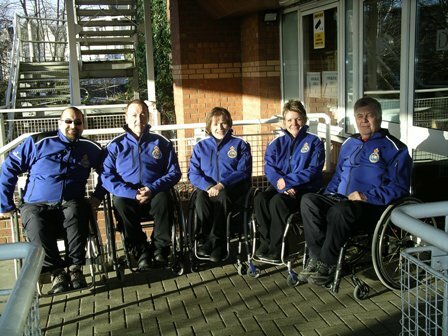 Previously participation in World Championships had been limited to users of manual wheelchairs. She is one of three changes to the Norwegian team made by coach Thoralf Hognestad, who returned to the team after their disappointing 3-6 finish at the Vancouver Paralympics. Tone, 36, is an occupational therapist and competing in her third season of wheelchair curling. Her major outside interest is photography, and you can see her photos at this link. Because of continuing delays in the paperwork allowing Alberta's Tony Zummack to relocate to Scotland and take up his position as National Coach, Dave Crosbee, British Curling's new Performance Director, has confirmed that Sheila Swan will be in charge of the Scotland team in at the 2011 World Championships in Prague. 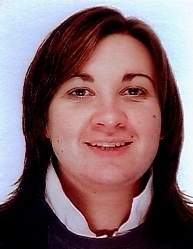 Sheila played on Jackie Lockhart's World Champion team in 2002, and is currently the Royal Caledonian Club's Development Manager - Adults and Disabilities. Tony is keen to take up his responsibilities and told me today: "I was very glad to see all eight athletes from the National Squad playing in the final three games in Lanarkshire. "To see Scotland reach the final against Canada should give the squad a sense of confidence heading to Prague. "While I wish I was there now I have full confidence in Sheila Swan as she knows the athlete's quite well as she was with them in Vancouver. Preparations are ongoing and I look forward to the day I am there to meet the entire team and staff." Canada posted two 4 enders to see off Scotland 2 in their morning draw, setting up a final with Scotland 1, who lost their unbeaten record, falling 6-5 in the morning to Hosts 1 after giving up a 4-ender. In the final Scotland were behind 5-3 with hammer, but gave up a steal of 2 in the 7th (final) end and Canada won 7-3, finishing the tournament with a perfect 5-0 record. The Czechs played Sweden in the battle of 2nd place teams, going out to a 4-1 lead and hanging on for a 4-3 victory. Scotland 2 beat Hosts 1 in the game between 3rd place teams. Bob Cowan follows wheelchair curling in Scotland and attended some of the action on Tuesday. You can see his photos HERE. He also noted that in the game he watched. Darryl Neighbour skipped while Jim played front end. Team Canada flew to Scotland on Sunday, and at 9AM on Tuesday were on the ice for the first of three draws on Day 1 of the Lanarkshire International at the Hamilton (SCO) Ice Rink. Scottish TV had cameras there at the start of the event. You can see the video at this link. Bruno Yizek was ill and unable to travel; his place taken by Manitoba's Chris Sobkowicz. Any jet lag did not seem to affect their performance as they posted 3 wins. They fell behind early in the opener against Sweden, but a 3 in the 3rd put them ahead, and they handed Jalle Jungnell his first loss as a National Coach, 6-3 in 7 ends. Sweden recovered to win their next two games, 8-6 over Scotland 2, and 6-5 over Mainhatten. 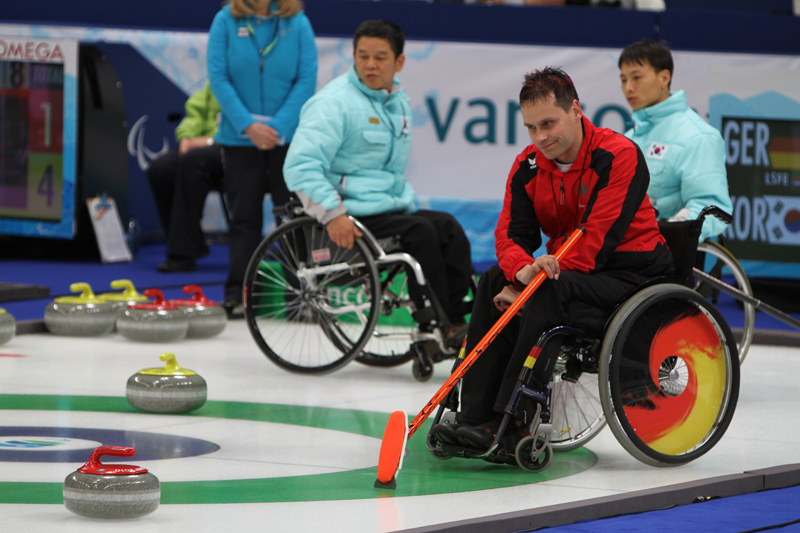 In Canada's second game Jens Jager's Mainhatten Ice Rollers managed only a single point in a 7-1 score in 6 ends. Canada finished a hectic day with a 7-4 win over Host Team 3 from the South Lanarkshire WCC. Scotland, still without new coach Tony Zummack, also posted 3 wins: 13-4 over Hosts 2, 6-2 over Marcus Sieger's Germany, and 11-2 over the Czech Republic. No word about where the Scots are delivering their stones from. This is the same team that won gold in Vancouver last March. Hopefully a team photo will be available soon. In response to a query about Team Canada's low profile this season, Program Director Gerry Peckham responded: "This has basically been a year off as it relates to the intensity and profile of Team Canada activities. Our focus has been on regionally based talent ID and development and our NTP athletes have been engaged in assisting Wendy and Joe with that undertaking along with a personal focus on their own skill development. They are willingly “putting back into the sport” and have done an excellent job on behalf of the program in the years to come…. "We will gear up again next year." It is understandable that after the rigours and the success of last season, National Team Program (NTP) members were entitled to an easier year post-Vancouver, and some have been very active in various CCA sponsored regional initiatives this season. On the other hand, with interest in wheelchair curling potentially at its highest after a Paralympic gold medal, more CCA or NTP information (and dare we suggest photos) on just what the national team has been doing since March would capitalise on that interest. While this blog receives responses to specific questions, the best publicity is proactive. Perhaps it's time for someone at the CCA or the NTP to be responsible for, and committed to, gathering and sharing publicity information. Canada will play in their second and final preparatory competition before defending their World Championship in Prague February 21, when they compete in the Lanarkshire International at the Hamilton Ice Rink (SCO) tomorrow, January 18. 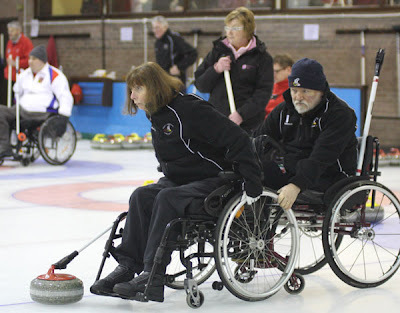 The event has been organised by the South Lanarkshire WCC who include three local teams in the ten team two pool field. Club secretary David Morgan told The Glasgow Evening Times the club, which has 33 players and includes members of the Great Britain Paralympic development squad, is all geared up for the two-day event. “We wanted to invite some good teams to play us. At first, we hoped for about four teams to confirm, but we have 10 and it will be a great event." Recently appointed Great Britain coach Tony Zumack is still awaiting paperwork for his move from Alberta, so the Scots, who have two new members, Gregor Ewan and Michael Mackenzie, will be mentored by Sheila Swan. Canada will play four round robin games games beginning against Sweden at 9AM local time Tuesday January 18. The first 3 teams play across the pools at 2.20PM Wednesday. Results will first be posted HERE. The CCA's StartCurling Campaign includes a skip using a wheelchair in one of the ads in their "shots made on purpose" series. Sudbury Curling Club will be joining Thunder Bay and Kenora in a challenge for the Northern Ontario Provincial Championship. Their team of skip Steve Daniel, vice Rick Prud'homme, second Sarah Lashbrook and lead Dennis Duclos practise up to six hours a week at the curling club, coached by Thomas Matheson. Skip Daniel is a multi-sport athlete who competed for Canada at the 2008 Paralympic Games in Beijing. 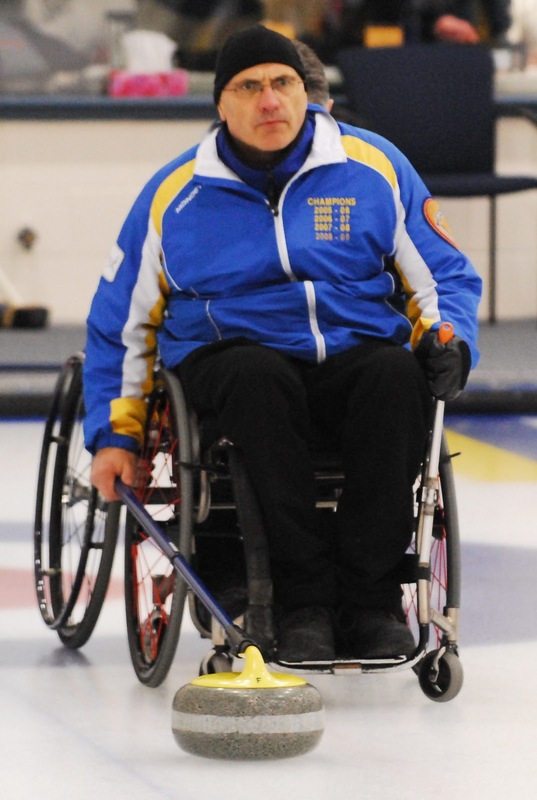 His team, in their first year of curling, hope to join an evening league, but playing at the Thunder Bay Provincials February 25-27 will be their first time competing against wheelchair opposition. "All our (Northern Ontario) teams are pretty much evenly balanced," he told the Sudbury Star. "We might even have a competitive advantage. All of us are coming from a sport background. We all play basketball together. The only thing we have to work on is the strategy of curling." Program booster Norm Gervais, owner of MEDIchair Sudbury, hopes that the 2012 Provincials will be held in Sudbury. "The Sudbury Curling Club is wheelchair accessible and very familiar with wheelchair curling - plus they know how to run and host top-notch curling events." The idea to host the 2012 Northern Ontario Championship has been put to club president Bill Sloan and will soon be brought to the club's board, said Gervais. The Accessible Sports Council for the London Ontario area, reminds wheelchair users that the Ilderton CC is the base for local curling. The program is run by coach Ernie Comerford, who was instrumental in establishing the sport in Alberta before relocating to Ontario. Sessions are held Sundays from 11AM to 1PM. More details HERE. There were 35 entries in last weeks poll, with 57% of the votes cast saying that Chris Daw would appear as a member of Team Canada before the Sochi Paralympics in 2014. 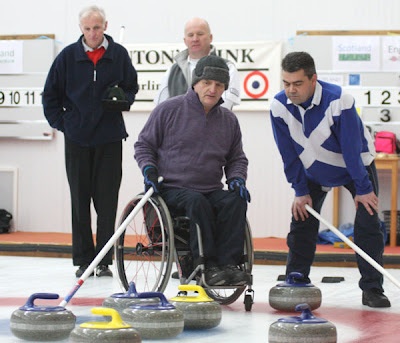 Team Canada fly to Scotland on Sunday January 16 to take part in the Lanarkshire International hosted by the South Lanarkshire Wheelchair Curling Club. The ten team field includes teams from Scotland, Sweden, Germany and the Czech Republic. Wednesday 19 at 09.00, 12.30, with the Final at 15.10. This week's question: will Canada win all their games in Lanarkshire? Press the button on the right margin of the blog, that corresponds to your opinion. Poll closes before play begins on January 18th. Curlers from PEI, Newfoundland and Labrador, New Brunswick and Nova Scotia will be attending a CCA sponsored development camp this weekend at Crapaud Community CC on Prince Edward Island. Attending will be members of the national coaching team Wendy Morgan and Dr. Laura Farres, Helen Radford, executive director of Curl Atlantic, as well as Team Canada lead Sonja Gaudet. The Guardian (Charlottetown) reports that it will be the first inter-provincial competition for wheelchair curlers held on the Island. Activites run from 2.30pm Friday January 14, through lunchtime Sunday. Team Germany's skip, Marcus Sieger, has been appointed as an Ambassador for Munich's 2018 Winter Olympics/Paralympics bid. Munich, site of the 1972 Summer Games, is competing against Annecy, France and Pyeongchang, South Korea. The decision will be announced on July 6th, 2011. On the eve of their tie-break game at the Vancouver Paralympics, Sweden's Glenn Ikonen, who had been throwing 4th stones for struggling skip Jalle Jungnell, was suspended for failing a drug test. The blood pressure medication that he had been taking for years across many tournaments, was through oversight or ignorance, in violation of the rules, and Glenn was not on the podium when Sweden ultimately placed 3rd. 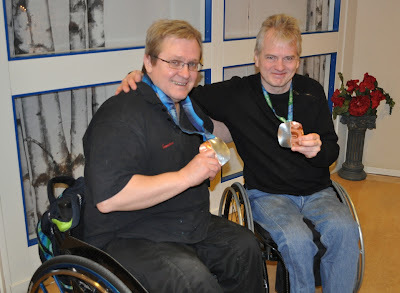 "He didn't get a medal, so I cut mine in half, made molds of the halfs in tin, and glued them together," said Jalle. "It just felt like the right thing to do. Glenn was so much a part of our medal team, it felt nice to give him a little piece of recognition. "Don't misunderstand, I totally understand the decision to suspend him, and not give him a medal, but as a friend, and as friends, we all suffered with him. "He was really happy when he got his half homemade medal, and shared happiness is doubled happiness." Wheelchair curling is arriving in New Brunswick with the 106 year old Fredericton CC hosting its first wheelchaair curling spiel January 28-30. The club is located on the Exhibition Grounds at the Coliseum. The field will be limited to 10 teams. Cost $40 per person. Contact Karen Malone 506-457-9802, or 506-459-3003. Full details on the flier HERE. Jalle Jungnell, Sweden's long time skip, announced after Vancouver that he would be retiring from international competition. Fortunately for those who care about the sport at the World level, he has returned to his national side, this time as coach. "Tomas Nordin (coach in Vancouver) would have been the ultimate choice for coach, we all feel, but he can not be away from work all the time that would be necessary," Jalle told me. "Tomas is still in the team, as an assistant coach during our training camps in Sweden." Thomas Wilhelm, the husband of lead Anette (who also retired after Vancouver) is team manager. "So, with three players from Paralympics, and me and Thomas as staff, it's pretty much the same faces, but at least myself in a different role," Jalle said. "Kicki is not totally new, as she played for Sweden 2007 and 2008. Gert also played 2007 when there was a different team representing Sweden at the Worlds in Sweden. "Where we stand ....? We don't know, and Scotland (Lanarkshire International) will be really interesting for us." Jalle is one of the true gentlemen in our sport, happy to share his knowledge and insights, appreciating that at this stage of the sport's development, athletes must be ambassadors and evangelists even while competing. He has this to say about funding. "It was interesting to read about the huge funding Scotland and Canada, had and have. We Swedes are in a totally different league. We got aprox. $50.000 for preparations for Vancouver, and have a total budget for $25.000 this year.....and that includes the Prague Worlds. "We are supposed to be a rich country, but we are definitely not spending the money on curling." Despite this comparative lack of financial resources, Sweden have won two bronze medals at the Paralympics and a silver at the 2009 Worlds. 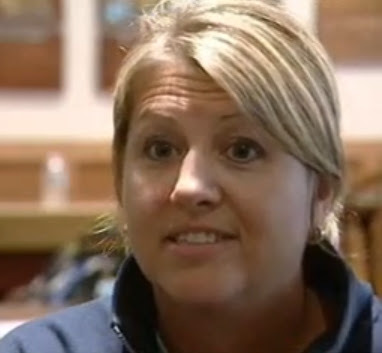 Penny Greely of Green Bay, Wisconsin, will replace California's Patrick McDonald on Team USA. Patrick announced he required shoulder surgery shortly after the USA selection camp last September, and would not be available for the 2011 Worlds in Prague. 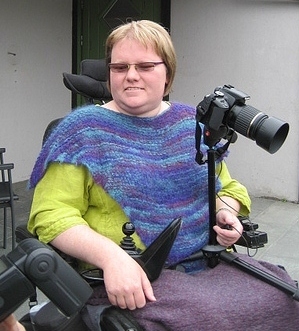 Greely is a high performance athlete who won bronze at the 2004 Athens Paralympics at sitting volleyball, but attendance at the selection camp, which was in her home town, was her first exposure to competitive wheelchair curling. Team leader Marc Deperno said: After a series of competitions and skill events, Penny Greely of Green Bay, Wisconsin has been selected as Patrick's replacement. Penny is a newcomer to the sport having only curled since September 2010 but has shown tremendous energy and commitment to her training regimen. We are excited to have Penny on board and are confident in her ability to assist Team USA with our goal of reaching the podium in Prague. You can watch a WBAY TV feature on Penny at this link. As we reported last September (before Patrick's announcement) it was the degree of difficulty that drew her more to the game. "I'm a really competitive person so this was right up my alley when I started playing." Will Chris Daw play for Team Canada prior to the Sochi Paralympics, 2014? Register your vote by selecting the button on the right margin of this page. Jack Smart, 46, who skips out of the Ogden Legion CC in Calgary AB, is this week's CCA Male Athlete of the Week. 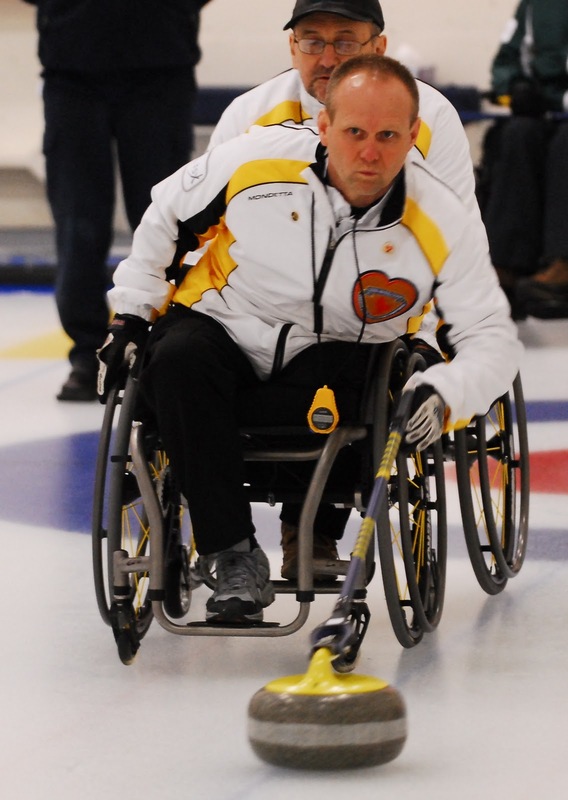 He has represented Alberta in both wheelchair basketball and tennis in addition to winning four provincial curling titles. Chris Daw: "I sat out Paralympics for my wife and daughter"
Curious about why Torino gold medal skip Chris Daw wasn't at the helm four years later in Vancouver? Tonight on Global TV News, Chris told reporter Mike McCardell that it wasn't becasue he didn't get along with the coach, or that he had a falling out with the program. Daw: I didn't give any explanation why, because it was my, it was my personal need, you know, to be with my family at the time. Daw: My wife was pregnant with our first daughter, and my wife said can I sit 2010 out for the Paralympics, and I said absolutely, anything for you, and for the birth of our daughter, and that's why we moved here and took the job. McCardell: So that's why you weren't in the last Olympics? Daw: And that's the absolute God's honest truth. 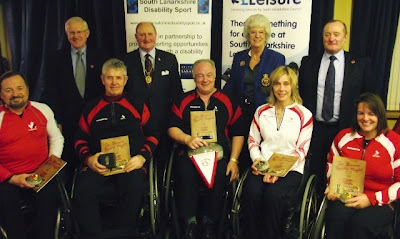 That's why I wasn't in the last Paralympics. It's no conspiracy theory, anything like that. It's just my wife asked my sit one out and I sat one out for her and my daughter. The news report ended with the studio anchor saying Chrs plans to be back for Sochi, 2014. 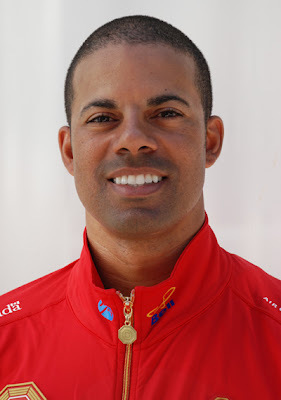 December 10, 2007 - Chris Daw asked that he not be considered for selection for the 2008 World Championships, and requested a "temporary leave of absence" from the National Training Program through the end of the season. He cited personal reasons as well as increasing demands on his time as Development Coordinator for the CCA's Discover Curling initiative. December 18, 2007 - Vancouver Sun reports: "I really like this (2008 Worlds) team ... they're very coachable, very easy to get along with, they're sponges for information and they're really flexible," said coach Joe Rea of Prince George. "There isn't an ego on the team and from a coaching perspective, that's a huge thing for me." Chris Daw wins gold at 2008 Ontario Paralympics throwing 4th stones for Ken Gregory's Team Bradford, but loses to Chris Rees in 2008 Ontario Provincials. October 22, 2008 - Jim Armstrong declared eligible to compete in WCF events. October 30, 2008 - Chris Daw breaks hip in ATV accident. December 17, 2008 - Armstrong chosen to skip Team Canada at 2009 Worlds. May 29, 2009 - Canada's Paralympic team has Armstrong at skip, with Neighbour, Forrest, and Gaudet. Bruno Yizek added at official announcement October 8, 2009. " Wendy Morgan says: "This has been a three-year journey in a comprehensive selection process. It has been a difficult process at times, as it is not exclusively a skill-based decision but encompasses team dynamics, peer assessment, performance in competition and positional aptitude." July 2009 - Chris Daw moves to BC as manager of the Vancouver CC. February 23, 2010 - Chris and Morgan Daw's daughter born. A family member has asked me to post the funeral arrangements for Frank Duffy. Frank's funeral will take place this Saturday, January 8th, at 9.30am in the Falkland Parish church with interment at Falkland Cemetery at 10.45am. Thereafter to Falkland Village Hall for lunch and refreshments and a chance to all meet up and celebrate his life.